Qualification: Candidates who have been declared qualified in the RRBs-Online CWE conducted by IBPS in September / October 2014. 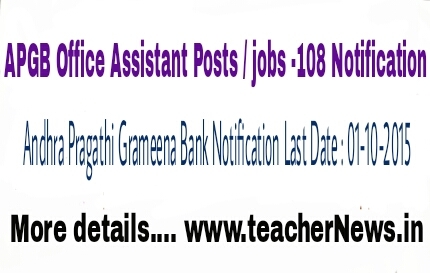 Selection Procedure of Office Assistant Posts : Office Assistant (Multipurpose): Selection will be made on the basis of performance in RRBs- CWE-III conducted by IBPS in September/ October 2014 and Personal Interview. Merit list of the candidates for final selection based on Total Weighted Scores (TWS) obtained by them in CWE - III of IBPS and Personal Interview will be prepared in descending order under each SC/ST/OBC/UR category. Depending on the number of vacancies, Bank will call from among who have applied to bank, the number, equivalent to three times the number of vacancies shortlisted based on their Total Weighted Scores (TWS) obtained in CWE – III of IBPS. Remaining applicants, if any will not receive an interview call from the Bank. 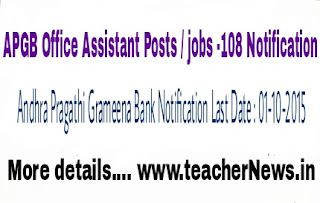 After call letter to attend The Interview will be held at the KADAPA centre and the displayed in the Bank’s website one week before the dates for commencement of Interviews.